Dynamic heart rate monitor with photo-sensor technology for increased accuracy. Monitor your blood pressure and compare it to your 7-day history. Personal trainer setting to guide and measure your workouts. 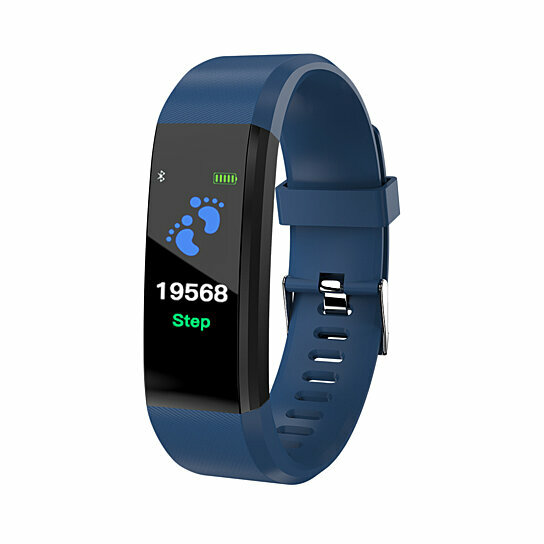 Track your activity via a step pedometer and distance tracker. GPS tracking technology that syncs with your smartphone to track your route. The onboard messaging system displays incoming caller name/ID, as well as text and social messages. Sleep monitor measures total sleep and relative quality. Receive sedentary alerts to help stay more active. 12-hour watch format with time and date. Calculate calories burned based on activity. Caller ID and call alert function. SMS alert and alarm alert. Sophisticated Bluetooth technology (4.015) allows the watch to sync with your Apple or Android device via a health-tracking app available for free in the iTunes App and Google Play stores. IP65 water resistant rating for robust outdoor use. Remote smartphone camera trigger capability. Apps can share fitness data via social media. Sturdy TPU buckle-style wristband will not break or slip. Usage when fully charged: 22 hours. To charge, remove one side of the band to expose the charging pin. 30 days of data storage. These come in 5 burst of colors. Select more, each sold seperately.